ARi Industries, Inc., a longtime market leader in temperature measurement, announces immediate availability of its AerOpak mineral-insulated (MI) thermocouple cable in an expanded assortment of sizes and sheath materials. MI cable offers thermocouple fabricators, instruments designers, process engineers and various equipment builders a unique solution to the challenges of temperature measurement and electrical signal-sending in harsh, corrosive and other hazardous environments. 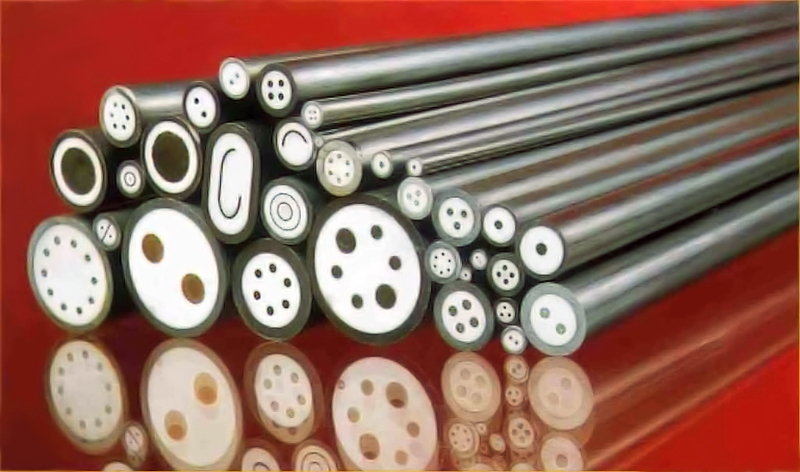 Offered as thermocouple and conductor cable, AerOpak products comprise thermocouple or conductor wires insulated with compacted ceramic powder, drawn and encased in a seamless metallic sheath material. Standard thermocouple or conductor cables up to 10-wire configurations are available in various stainless steel, Hastelloy and Inconel sheath materials in OD sizes ranging from 0.020” to 0.750” diameter. Cable can be supplied for temperatures up to metal melt points of 2600ºF and over 1000 ft. in length, making these products suitable for all types of process operations and very large equipment. Owing to the strict manufacturing and production standards of ARi, MI cable signal integrity is consistent over the longest length applications. Thermocouple cables in Types K, E, J, T, N, R, S, and B are stocked in calibration tolerances to meet all applicable ASTM, IEC and ANSI standards. MI cable from ARi can be welded, brazed or soldered in the field, relative to the application and techniques used. Please consult the manufacturer for details or installation assistance. Custom wire configurations, other sheath materials and assorted insulation ingredients are also available on request, to suit virtually all applications. For full details and specifications on this line of products, please request Bulletin 4.0. ARi Industries, Inc. is a division of Okazaki Manufacturing Company (Japan). ARi Industries is a manufacturer of mineral-insulated wire and cable, thermocouples, RTD’s, thermowells and temperature transmitters, as well as conductor cable assemblies, neutron detectors, electric heating elements of various types and related hardware. The company is ISO-9001-2000 Certified and performs X-ray inspection, helium leak testing, temperature calibration traceable to NIST and other analytical services. The company is a worldwide supplier to instrument, power generation, aircraft and other equipment builders, as well as all process industries, serving the most demanding environments.